The U 18 was one of at least three U -boats known by the British to be operating in the waters around Orkney late in November 1914, the other two being the U 16 (Kapitanleutnant Hansen) and the U 22. It was due to the sighting of U-boats around Orkney, and the fact that the defences to Scapa Flow were not yet in place that the Admiralty took the decision, on the 22nd November to sail the fleet from Scapa Flow to ports on the East Coast of Scotland. It took the sinking of U 15 off Fair Isle in August 1914 to show the Royal Navy the real threat that Submarines now posed to the Fleet at anchor in their main North Sea Harbour. Until then no one believed U-boats had the range to venture that far into the North Sea. On the 1st September 1914 an incident took place which went to show how seriously the Admiralty took the threat. A lookout caused a scare when he believed he saw a periscope in the harbour area, the fleet put to sea in a great hurry, some ships even firing their guns at what they thought to be periscopes. In fact no U-boats had entered the Flow and the whole episode became known as the ''First battle of Scapa Flow''. There was a repeat performance just six weeks later, and just goes to show how seriously Jellicoe now took the threat to his ships in what was still a very un-secure anchorage. 14th November 1914 the U 18 set off from her base in Heligoland to patrol the waters off the Orkney Isles. On the night of the 22nd from a position SE of the Islands Kapitanleutnant Von Henning, commander of U18 noticed searchlights in the direction of Scapa Flow and thinking the fleet was in Harbour decided to make an attack on the anchorage itself. As the U 18 approached the Pentland Firth the crew were surprised to see the Pentland Skerries lighthouse lit, they were not to know but this was to aid the Fleets evacuation from Scapa that night. When level with the Skerries, with batteries full, the U 18 dived to enter Hoxa Sound. 11 am, aided by the strong tides and the fact that the Boom nets were open to allow a Steamship to pass the U 18 entered Scapa Flow, Von Henning raised periscope, and to his disappointment noticed the flow to be empty. 11.20 am. As no worthy targets were in Scapa Von Henning decided to make his way back out through the Hoxa Boom and out to open sea. 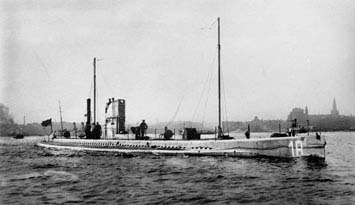 At the entrance to Hoxa Sound the U 18's periscope was spotted by the examination steamer Tokio, who raised the alarm, the whole patrol were now looking for him. To negotiate her way back out into the Pentland Firth the U- 18 had to keep coming up to periscope depth. Von Henning did this once too often. 12 10pm.The minesweeper No 96 which in peacetime was the Aberdeen trawler Dorothy Gray (ex A212), was patrolling the entrance to Hoxa Sound when the skipper Capt. Youngson RNR noticed a periscope 1 ¼ miles off Hoxa Head, and took the only action open to him and rammed the U-boat. The Dorothy Grey lifted three-foot in the air; the excited crew seized anything handy to throw at the Submarine in a vain attempt to damage it. The U-boat was thrown on its beam-ends, her steering gear and Hydroplanes were damaged and periscope bent over at right angles. Von Henning seemed in a hopeless position with a blind, half-crippled submarine but again the U 18 dived still trying to make the open sea. See-sawing up and down, unable to maintain her depth the U 18 struck the seabed so hard that it sent her once more to the surface where he was met with another crash, not the Dorothy Grey this time but a Destroyer. HMS Garry was answering to a rather ecstatic signal sent by Dorothy Grey when the U-boat surfaced right in front of her, and was rammed ''good and proper''. U 18 dived once again this time hitting the seabed in 230 feet. The Forepart of the U-boat was badly damaged, but Von Hennig still tried to slip away, but a short while later she struck another rock and this time she struck so hard she damaged her props and a fire started in the battery room. The situation was now grim for the U-boats crew , Von Henning only had one choice left to him and that was to surrender. Two destroyers, the HMS Erne & HMS Garry were soon closing on the U-boat whereupon Von Henning gave the order to scuttle, and seacocks were opened. As the destroyer Garry came alone side the U 18 Sank. Three officers and 23 of the crew then swam to the Garry and were taken prisoner, one crewman drowned. The circumstances surrounding the loss of the U 18 were kept secret in the hope that the Germans would believe she fell foul of the Scapa defences which were in fact still 9 months from completion. The next Day the U 16 entered Scapa Flow through Hoxa Sound but seeing the Fleet Had sailed slipped back out without being spotted. U 22 also tried to enter but due to a defective engine could not fight the tide and had to retire. These were the last U-boat attacks on the Flow itself until the tragic UB 116 attempt in 1918. The Battle of Jutland (German:Skagerrakschlacht) was a naval battle fought by the British Royal Navy's Grand Fleet under Admiral Sir John Jellicoe against the Imperial German Navy's High Seas Fleet under Vice-Admiral Reinhard Scheer during theFirst World War.The battle was fought from 31 May to 1 June 1916 in the North Sea, near the coast of Denmark's Jutland Peninsula. It was the largest naval battle and the only full-scale clash of battleships in the war. It was only the third-ever fleet action between steel battleships, following the smaller but more decisive battles of the Yellow Sea (1904) and Tsushima (1905) during the Russo-Japanese War. HMS Vanguard was a St Vincent-class dreadnought battleship built for the Royal Navy in the first decade of the 20th century. She spent her whole career assigned to the Home and Grand Fleets. Aside from participating in the Battle of Jutland in May 1916, her service during World War I generally consisted of routine patrols and training in the North Sea. Just before midnight on 9 July 1917 at Scapa Flow, Vanguard suffered an explosion, probably caused by an unnoticed stokehold fire stored against an adjacent bulkhead in one of the two magazines which served the amidships gun turrets 'P' and 'Q'.She sank almost instantly, killing an estimated 844 men; there were only two survivors. The site is now designated as a controlled site under the Protection of Military Remains Act. One of the casualties of the disaster was Captain Kyosuke Eto, a military observer from the Imperial Japanese Navy, which was allied with the Royal Navy at the time through theAnglo-Japanese Alliance. In terms of loss of life, the destruction of the Vanguard remains the most catastrophic accidental explosion in the history of the UK, and one of the worst accidental losses of the Royal Navy. During World War I, UB-116 was tasked with penetrating Scapa Flow and taking out as many ships as possible to even the odds for a last attack by the German High Seas Fleet. An earlier attempt to confront the British Grand Fleet and bring them to battle had been frustrated by the Kiel sailor mutiny. UB-116 left Heligoland U-boat base on 25 October 1918. German intelligence was poor at this stage of the war and they did not know that Scapa Flow had not been used since April 1918. The British Grand Fleet was, in fact, based at Rosyth on the Firth of Forth in anticipation of a planned last sortie by the Germans being further south. The U-boat's captain Lieutenant JJ Emsmann had been advised to use Hoxa Sound as Royal Navy vessels had been seen, by other U-boats in the Pentland Firth, using this entrance to Scapa Flow. However Hoxa Sound was protected by a minefield that was controlled from the shore. Hydrophones at Stanger Head on Flotta were the first to pick up the sound of UB-116's engines at 8.21 pm on 28 October 1918. As no friendly ships were expected the detector loops on the seabed were activated. These would generate an electric current when the magnetic field of any vessels that crossed them. The U-boat was spotted when Emsmann came to periscope depth at 11.30pm to check his position. The mines were detonated and UB-116 was destroyed. She was the last U-boat sunk in World War I. The wreck of the U-boat was raised in 1919 but foundered further into Scapa Flow (Larn and Larn, 1998). It lies at the mouth of Pan Hope, a large inlet on the east side of Flotta. The remains were sold for scrap in 1969 and most of the U-boat was dispersed during operations to retrieve the 10 live torpedoes still onboard by a controlled explosion and to clear the channel for the passage of large tankers. Germany signed the Armistice with the Allies on 11 November 1918. Article XXI of this ordered the surrender of all German U-Boats, over 200 were handed over, mostly within the next two weeks. Article XXIII involved the handing over and internment in Allied or neutral ports of seventy-four named warships, their fate to be determined by the peace negotiations. Rear-Admiral Ludwig von Reuter was given command of this force and used Friedrich der Grosse as his flag ship. Apart from the unpleasant task of surrendering a powerful undefeated fleet he also had major problems with his men, many of whom were mutinous with communist tendencies and he had to ensure that his fleet was disarmed. On the 19 November the German force set sail for the Firth of Forth where the British would check that the disarmament was complete before moving to other ports to be interned. The torpedo-boat V30 strayed off course and was sunk by a mine. The Germans arrived at the Firth of Forth on the morning of 21 November and were met by an Allied force of 250 ships under Beatty which included most of the Grand Fleet, an American Battleship squadron and representatives of other navies with a total of forty four capital ships. The Allied guns were trained fore and aft but the gun crews were ready for action. At 3.57 p.m. the German flag was ordered to be hauled down and was not hoisted again until the ships were scuttled. The British checked each ship thoroughly to ensure disarmament and were apparently impressed with the quality of the ships, if less so by the crews. From the 22-26 November the German ships left in groups for Scapa Flow, all having arrived by 27 November. German battlecruisers at Scapa Flow. The German crews were confined to ship, a situation they were not used to. German crews often lived on shore and spent relatively short periods on their ships, unlike the British who lived on board when in port. This enabled German ships to benefit by having fewer doors in their bulkheads but they were less habitable than the British ships. The Germans were not happy at being interned at Scapa Flow as they felt that they should have been interned in a neutral port, and that the British were breaking the spirit, if not the word of the Armistice. They were however in no position to do anything about it. By mid December the 20,000 crew who who had sailed the ships to Scapa were reduced to a caretaker crew of 200 per battlecruiser, 175 per battleship, 80 per light cruiser and 20 per destroyer (torpedo-boat) leaving a nominal total of 4,565 plus 250 officers and warrant officers, although the exact actual figures are thought to be higher. This was considerably more than the British thought necessary but for once the German view prevailed. There were considerable discipline problems amongst revolutionary elements in the German crews, with c150 trouble makers being sent home and Reuter changing his flag to the cruiser Emden. In June 1919 the crews were reduced to Royal Navy caretaker levels, 75 per battlecruiser, 60 per battleship, 30 per light cruiser and whatever was necessary for the destroyers, a total of about 1,700. During this time the peace talks had been dragging on, with several extensions to the Armistice, and the Treaty of Versailles was not ready until May 1919. The Allies were divided over the fate of the ships with many countries wanting a share, whilst the British, the major naval power at the time, were less keen to boost the strength of rival navies. The treaty involved the surrender of the interned ships. When Reuter heard this he became concerned that the British would seize the ships without notice and started active planning to scuttle the fleet, although he had been considering the option for some time. The British were also well aware of the danger and had plans for armed seizure of the ships. The German officers planned the scuttle, the troublesome crews were not told but in many cases worked out what was going on by watching the officers making preparations, many of the crews were then told. Bayern as raised in 1933. She fetched a scrap value of £110,000 nearly half of which was profit. The salvage operations on the various ships started in the early 1920's with most of the ships having been raised by the late 1930's. Since then fragments of ships have been raised and since Hiroshima they remain an important source of quality radioactive free metals necessary for certain types of sensitive scientific instruments. On the morning of 21 June the British battleships at Scapa Flow, the First Battle Squadron, with their escorts left for exercises. At 10.30 am on 21 June Reuter signalled the fleet "Paragraph eleven. Confirm." - the code for immediate scuttle. It took a while for the message to get around the fleet and it was an hour before all the ships acknowledged the signal. The only British warships present were the destroyers Vespa and Vega as were a couple of depot ships and various trawlers and drifters. They signalled the First Battle Squadron which returned to base at full speed. The British managed to beach the Baden and the cruisers Nürnberg, Emden and Frankfurt, all the other major units sank. In the confusion nine Germans were shot dead, the last kills of WWI, although nobody was drowned, on the whole light casualties under the circumstances. Over 400,000 tons of modern warships were sunk, the largest loss of shipping in a single day in history. Publicly the British were outraged but in private there was a sense of relief that the problem of what to do with the fleet was now ended. Considerable efforts were made by British Intelligence to prove that the scuttling had been authorised by Berlin but they never found any proof. Bayern sinking. She and her sister, Baden, were the most powerful German ships of the war, being armed with 15in guns. They were the first German ships to have equivalent firepower to British ships, rather than smaller guns but thicker armour. They had hybrid propulsion systems with a mixture of coal and oil , less efficient than the all oil systems then in use by the British, but they were still the fastest German battleships of the war. During the 1920s and 1930s the majority of the scuttled ships of the German High Seas Fleet were raised. It was one of the largest maritime salvage operations in history. Of the 52 ships that sank, only 7 remain beneath the waters of Scapa Flow. The initial salvaging operations began as early as 1919 and concentrated on the removal of many of the blockships. This was to allow the Holm and Burray piers, as well as the herring stations, to be used again. The first successful salvage operations on the German High Seas Fleet came in 1922 and were led by Jack Moar from the Orkney Island of Hoy. He started with the destroyer G89. The salvage operations stepped up a gear over the next decade with Cox and Danks Ltd raising a total of 32 ships for the valuable steel in their hulls. Most of the salvage work pre-dated WWII but some operations continued until 1979. Seven ships were never raised and today these provide some of the best wreck diving the world has to offer. Jack Moar, who worked in one of the forges in Stromness, was part of a syndicate that bought the German destroyer G89. It was lying in shallow water off Fara and in December 1922 it was refloated and towed to Stromness Harbour where it was hauled ashore at the North End. The Shetlander JW Robertson formed this company in Lerwick and bought four destroyers for breaking. He purchased two concrete barges from the Admiralty and set up a framework of girders across the gap between them. Two huge buoyancy bags were attached to a sunken vessel and then steel cables were threaded underneath the ship. The cables would then be wound in. This technique proved successful on the smaller vessels. Cox and Danks Ltd comprised steel and iron merchants in London and engineers and shipbreakers in Kent. The firm bought 26 of the destroyers and two of the bigger ships, including the battlecruiser Hindenburg in 1924. Ernest Cox was the sole partner in the firm at the time, having bought out his partner Tommy Danks. Cox had no experience in salvage operations, but was a brilliant engineer. He bought a huge floating dock - which had been seized by Britain as part of the reparations for scuttling the fleet - along with two ex-Admiralty sea-going tugs. The dock went to Mill Bay on Hoy to be near Cox's headquarters at Lyness (Hewison, 1985: 181-2). Cox's first salvage attempt was the torpedo boat destroyer V70 in 1924. The floating dock was cut into two L-shaped sections, which were manoeuvred into position on either side of V70. After a failed and dangerous attempt, which resulted in chains placed underneath the vessel breaking, wire cables were used instead. On 4 August 1924 and after six weeks of work, Cox was able to beach V70. He was furious to discover that locals had already removed the valuable torpedo tubes (MacDonald, 1990: 38). By 1 May 1926, Cox had taken up all 26 of his destroyers and had started work on the Hindenburg. This had been one of the largest ships in the Kaiser's navy at just over 26,000 tons. The Hindenburg had sunk on an even keel in about 21 metres of water - a comparatively shallow depth. The ship's superstructure jutted above the surface and was a prominent seamark for miles around. A few setbacks meant it was some years before the Hindenburg was raised, despite the fact it was lying in shallow water. One such setback were miners' strikes, which resulted in a shortage of coal to fire the steam pumps. Thankfully the battlecruiser Seyditz was scuttled with full coalbunkers and part of its hull remained above water. It didn't take long to cut away the armour-plating and recover the much needed coal (Hewison, 1985: 185-6). Cox finally raised the Hindenburg on 23 July 1930. These companies took over the salvage operation in the 1930s and proved to be much more commercially successful than Cox. Whereas Cox was £10,000 down at the end of his eight year salvage operation, these companies were able to generate a profit of £50,000 on each of the larger ships, which included the battleships Bayern and Derfflinger. Dougall Campbell bought out Arthur Nundy's salvage business in 1971. The business included land on Flotta as well as the old cinema and west pier. It also included land on Hoy, the Rinnigil Pier and the British ex-boom defence vessel the Barneath, which had a strong stern winch. HMS Royal Oak was one of fiveRevenge-class battleships built for the Royal Navy during the First World War. Launched in 1914 and completed in 1916, Royal Oak first saw combat at the Battle of Jutland as part of the Grand Fleet. In peacetime, she served in the Atlantic, Home and Mediterranean fleets, more than once coming under accidental attack. The ship drew worldwide attention in 1928 when her senior officers were controversially court-marshalled. Attempts to modernise Royal Oak throughout her 25-year career could not fix her fundamental lack of speed and by the start of the Second World War, she was no longer suited to front-line duty. On 14 October 1939, Royal Oak was anchored at Scapa Flow in Orkney, Scotland, when she was torpedoed by the German submarine U-47. Of Royal Oak‍ '​s complement of 1,234 men and boys, 833 were killed that night or died later of their wounds. The loss of the old ship-the first of the five Royal Navy battleships and battle cruisers sunk in the Second World War-did little to affect the numerical superiority enjoyed by the British navy and its Allies, but the sinking had considerable effect on wartime morale. The raid made an immediate celebrity and war hero out of the U-boat commander,Günther Prien, who became the first German submarine officer to be awarded the Knight's Cross of the Iron Cross. Before the sinking of Royal Oak, the Royal Navy had considered the naval base at Scapa Flow impregnable to submarine attack, and U-47‍ '​s raid demonstrated that the German Navy was capable of bringing the war to British home waters. The shock resulted in rapid changes to dockland security and the construction of the Churchill Barriers around Scapa Flow. The wreck of Royal Oak, a designated war grave, lies almost upside down in 100 feet (30 m) of water with her hull 16 feet (4.9 m) beneath the surface. In an annual ceremony to mark the loss of the ship, Royal Navy divers place a White Ensign underwater at her stern. Unauthorised divers are prohibited from approaching the wreck at any time under the Protection of Military Remains Act 1986. The German submarine U-47 was aType VIIB U-boat of Nazi Germany's Kriegs marine during World War II.She was laid down on 25 February 1937 at Friedrich Krupp Germaniawerft in Kiel as yard number 582 and went into service on 17 December 1938 under the command of Günther Prien. During U-47‍ '​s career, she sank a total of 31 enemy vessels and damaged eight more.She is also noted for the sinking of the British battleshipHMS Royal Oak on 14 October 1939.U-47 ranks as one of the most successful German U-boats of World War II. On 8 October 1939, U-47 began her second patrol. On 14 October 1939 (six days after leaving port), she succeeded in penetrating the Royal Navy's primary base at Scapa Flow. Although most of the Home Fleet was not at the base at the time, U-47managed to find a target, the battleship HMS Royal Oak. Once she had spotted Royal Oak, she opened fire with her torpedoes. Her first two salvos did nothing more than sever an anchor chain. After reloading the bow tubes the last salvo of three torpedoes struck the British warship, causing severe flooding. Taking on a list of 15 degrees, her open portholes were submerged, worsening the flooding and increasing the list to 45 degrees; Royal Oak sank within 15 minutes with the loss of over 800 men. Following the attack, Prien received the nickname Der Stier von Scapa Flow ("The Bull of Scapa Flow"); the emblem of a snorting bull was then painted on the conning tower of U-47 and the image soon became the emblem of the entire 7th U-boat Flotilla. Prien was awarded the Knight's Cross of the Iron Cross, the first sailor of a U-boat and the second member of the Kriegsmarine to receive this decoration. The rest of the crew members were awarded the Iron Cross.Two other U-47 crew members also earned the Knight's Cross of the Iron Cross later on during World War II: the chief engineer (Leitender Ingenieur) Johann-Friedrich Wesselsand 1st watch officer (I. Wachoffizier) Engelbert Endrass. Many years later, in September 2002, one of the unexploded torpedoes that U-47 had fired during the attack on Royal Oak rose to the surface from its resting place on the bottom. The unexploded torpedo, minus its warhead, gradually drifted towards the shore, where it was spotted by a crewman aboard the Norwegian tanker Petrotrym. A Royal Navytugboat intercepted the torpedo, and after identifying it as having belonged to U-47 63 years earlier, EOD (explosive ordnance disposal) personnel discarded it a mile from shore. U-47 went missing on 7 March 1941 and was believed to have been sunk by the British destroyer HMS Wolverine west of Ireland, when the submarine was attacked by Wolverine and HMS Verity. The British ships took turns covering each other's ASDIC blind spots and dropping patterns of depth charges until U-47 rose almost to the surface before sinking and then exploding with an orange flash visible from the surface, but it seems likely that the boat attacked there was U-A, part of the foreign U-Boat corps. To date, there is no official record of what happened to U-47 or her 45 crewmen, although a variety of possibilities exist, including mines, a mechanical failure, a victim of her own torpedoes, or possibly a later attack that did not confirm any claims by the corvette team of HMS Camellia and HMS Arbutus. U-47 had a crew of 47 officers and men during her last North Atlantic patrol in early 1941, all of whom were presumed to have died. Unfortunately, the deployment of the blockships was to prove less effective than planned, and on October 14, 1939, Günther Prien took advantage of an extremely high tide and arrived at Kirk Sound where he successfully navigated U-47 past the blockships placed between Mainland and Lamb Holm (later closed by barrier No 1) and entered Scapa Flow. Undetected, he was able to carry out two attack runs, and of seven torpedoes launched, three struck HMS Royal Oak which sank within 15 minutes. The attack came as such a surprise that all attention was initially focussed on the air, as no-one believed submarine attack possible. This confusion provided Prien the time needed to make his escape through the same channel he had arrived through, albeit by a different route as the tide had ebbed and closed his original path. The Royal Oak had a complement of 1,208 officers and men, 833 were lost, with 375 survivors, the largest loss of life in home water of World War II, followed by HMS Dasher. The result could have been much more extreme, although Prien's intelligence had correctly identified the ships in Scapa Flow, much of the home fleet had departed the previous night, bound for the Norwegian coast. Among them the battle cruisers Hood and Repulse, the battleships Nelson and Rodney, and the aircraft carrier Furious. The impact of Prien's attack can only be imagined had he arrived a few days earlier, or if the ships had sailed later.